Guests stay at a facility for an average of 2.7 hours, according to the most recent IAAPA Family Entertainment Center Benchmark Report. But say you stretch the visit by just another 20 or 30 minutes, and during that time customers grab another drink, or play a few more games. Hypothetically, add an extra five dollars for every guest who walks in the door of a facility with an annual attendance of 200,000 people, and that equals an additional 1 million dollars in revenue each year. Learn how to maximize your guest potential with these five ways to increase length of stay. While FECs do not necessarily need to add a major attraction, they should still actively look for new elements. This is especially helpful in dead spaces, says Marty Desrochers, president of Davenport, Florida-based Operation: Pineapple, a hospitality company that specializes in management, consulting, research, and education. For example, facilities with high ceilings can install a ropes/zipline course. He recommends escape rooms as a non-budget-busting addition with a small footprint that should increase length of stay. The attraction lasts roughly an hour, making it a big per-capita item. Plus, guests typically pre-book, so managers can better schedule labor. Escape rooms also naturally drive food and beverage sales. “People grab a drink before or stay after to talk about the experience,” Smith says. Stationary virtual reality attractions and mini-bowling can be two other smart, cost-effective pieces to add, he says. 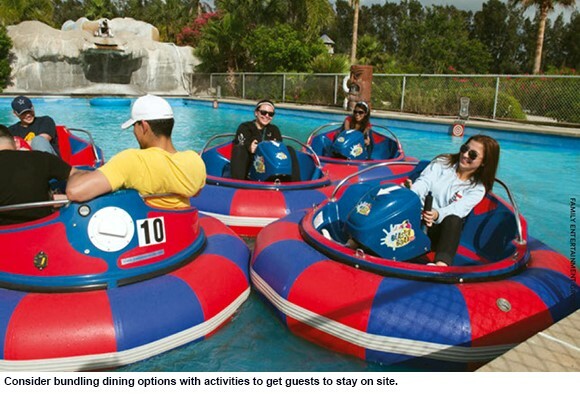 The former may give a facility a competitive edge over other nearby entertainment venues, while the latter could take a family as much as a half hour to play. • Almost half of U.S. citizens (47 percent) identify themselves as foodies. • More than six in 10 (62 percent) say they are “totally adventurous” when trying new foods. • Over two-thirds (68 percent) describe themselves as passionate about food and drink. Smith acknowledges it may be difficult for an FEC to become a five-star gourmet restaurant, but facilities should at least strive to elevate the kitchen to a notch above frozen pizza, while also limiting the menu choices to streamline operations. Sipping an adult beverage often goes hand-in-hand with an improved food selection. Both Smith and Desrochers say FECs might consider securing a beer-and-wine license, a far more affordable option than a full liquor license. Once an FEC has a healthy attraction mix and upgraded food options, it can better maximize packages for guests, Desrochers says. For instance, a $14.99 dine-and-play deal that includes an entrée and one-hour play card makes customers think twice before leaving to grab a bite to eat. The key to successful bundling comes from how staff sells it, he notes. To discover the most appropriate package to recommend, employees should ask customers investigative questions about what attractions they are excited to visit and how long they plan to stay. One caveat is that staff should never deliver the hard sell or “guilt-trip shtick.” He recalls one facility where an employee would intentionally sigh and act sheepish if a guest turned down a package. Ron Kostelny, president of Nickels and Dimes, which operates 10 Tilt Studios across the United States, says employees will point out deals that might be a better value, but shy away from being pushy. Uncomfortable adults reveal themselves with bored stares, frequent watch glances, and, before long, quick trips to the exit. As a remedy, FECs should set up a parent lounge with relaxing seating (not stiff plastic chairs) in an area away from the noise, Desrochers says. Along with that, provide free Wi-Fi so guests will not have problems accessing the Internet or eating up their data plan.